Cage PG can be a single-main-tether from pilot pod to cage (bridle device; kite control unit) where pilot moves the cage to control the wing; pilot is below the cage by a main tether; cage is a fancy kite-control-bar structure; wing design is adjusted to fit the cage mode of operation. "AsPiC", Association des Pilotes de Cage. http://www.aspic.org/ Born: October 30, 1999. The cage in PG is an extended kite-control structure for gliding kites. 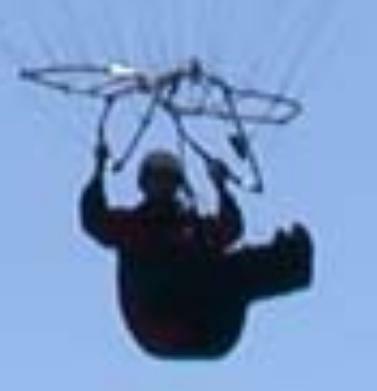 rigid parts in paraglider: bridle-line-cascade spreader bars, cage structure, spanwise spars, LE formers, rib parts, and more is allowed for "paraglider" that has no limits to solidity or rigidity. Look to aerogels, stuffs, nano-matrix, etc., besides standard rigid wings that may be used in some paragliders (gliding kites). Explore all kite-control devices to see how the cage fits in the history. Notice the various patents for hand-held and hand-harness structures for controlling kited wings.